"Anthony Rapp - Without You"
"Anthony Rapp - Without You," based on Rapp's bestseller Without You: A Memoir of Love, Loss, and the Musical "Rent," begins performances at Boston's Modern Theatre at Suffolk University for one week beginning June 19. The Modern is located at 525 Washington Street in Boston's Theatre District. "Without You" is produced by Chocolate Factory Productions in association with Royal Family Productions. Directed by Steve Maler, the production has music by John Keaney, David Matos, Joe Pisapia, and Anthony Rapp and features songs from "Rent," music and lyrics by Jonathan Larson. 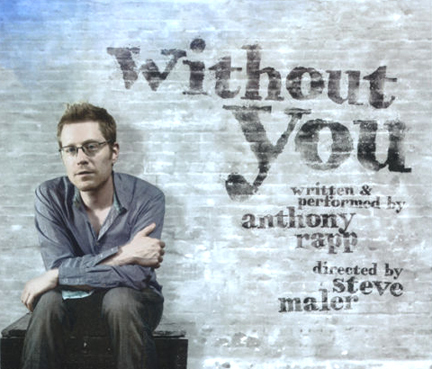 Later this summer, "Anthony Rapp - Without You" will be presented at the Edinburgh Fringe Festival followed by performances at London's Menier Chocolate Factory. In 1994, Anthony Rapp was working at a New York Starbucks and about to audition for a new musical by a young guy named Jonathan Larson. This is where "Without You" begins. Rapp shares his audition for "Rent," getting cast, rehearsals, and his view from the stage during the tribute performance the night after Jonathan’s tragic death. "Without You," which also details Anthony’s touching relationship with his mother during this turbulent time, celebrates all of our seasons of love. Rapp’s memoir, Without You: A Memoir of Love, Loss, and the Musical Rent (Simon & Schuster, 2006), was a New York Times bestseller and is currently in its sixth paperback printing (in addition to its nine hardcover printings). Upon its publication it received rave reviews. From Entertainment Weekly: "No roar-of-the-crowd, smell-of-the-greasepaint scrapbook; it's a sprawling, tear-streaked life story and unabashedly sentimental ode to his mother." Publishers Weekly said: "A sensitive, heartfelt memoir . . . Absorbing, warm, and hopeful, the book celebrates a man, his work, and a generation." The San Francisco Chronicle added: "Pitch-perfect . . . a book for anyone who has experienced great loss, [and] for anyone who has survived and grown because of that loss." Anthony Rapp has been acting and singing professionally since he was nine years old. In addition to his work in Jonathan Larson’s Tony Award and Pulitzer Prize-winning "Rent," he has been seen in the revival of "You’re a Good Man, Charlie Brown" and John Guare’s "Six Degrees of Separation." His Broadway debut was in "Precious Sons" with Judith Ivey and Ed Harris, for which he received an Outer Critics Circle Award and a Drama Desk nomination. His most recent stage appearance was in Second Stage Theatre’s "Some Americans Abroad." Steven Maler is a freelance theater, opera and film director and the founding Artistic Director of Commonwealth Shakespeare Company (CSC), which annually presents free productions of Shakespeare on Boston Common. For tickets, call 1-800-247-4360 or visit www.withoutyoutheshow.com. For performances at the Edinburgh Fringe Festival (August 1 - 26) visit www.underbelly.co.uk. ; For performances at London's Menier Chocolate Factory (August 29 - September 15), visit www.menierchocolatefactory.com.